Hello Frndzzz.... www.dealsnloot.com Back With New PayTm 100% Cashback Flash Sale [Live On 4 PM]. Wait for PayTm 100% Cashback Sale lover is over, this Diwali PayTm has come up with 100% Cashback sale on 3rd, 4th & 5th November. Shipping may be extra.Enjoy 100% Cashback sale across all categories including Fashion, Home & Kitchen, Mobiles, Electronics, Sports & Fashion, Books, Toys, Gifts & Automotive. 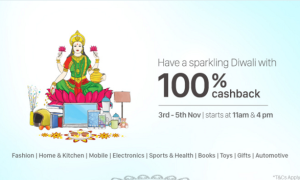 ‪#‎TheBigDiwali100‬ 100% cashbacksale is starting at 11 AM #‎PaytmKaro‬.